Good news for those who like to use Gnome Shell on Ubuntu. Starting with Ubuntu 12.10, there will be separate Ubuntu 12.10 build based on vanilla Gnome Shell. 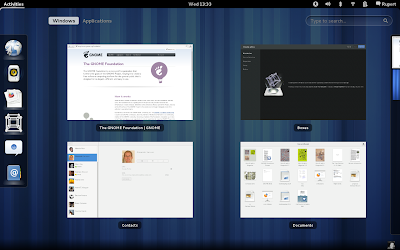 The desktop interface will provide out of the box upstream Gnome 3 experience. This Gnome Shell based Ubuntu Flavor is unnamed yet. Some names were suggested like GNObuntu, GNOME OS, GNOME Ubuntu, Ubuntu GNOME, UbuGNOME etc. but there is no final decision yet. Gubuntu cannot be used here as Google already have their custom Ubuntu based distro Goobuntu. It should be noted that Unity will be always primary focus of development though. Full session notes can be found here.